Striking a chord: Rebel rockers entertain islanders at Iejima's summer festival in 2010. During the 30-minute ferry ride from Motobu on mainland Okinawa, Iejima reveals itself in stages. First, Mount Tacchu emerges above the waves like a chunk of the peanut brittle for which the island is renowned. Next, the wind-blown scent of countless thousands of hibiscuses sweetens the stink of the ship’s diesel engines. 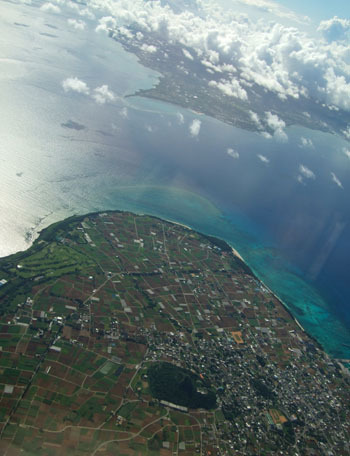 Finally, swaths of sugar cane come into view — followed by khaki-green tobacco fields and white sand beaches flanking the island’s southern shores. Without question, Iejima is a beautiful place — but dig a little deeper and you soon realize that, beneath its rich red soil, there lies an awful lot of suffering. 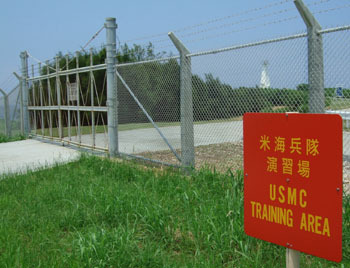 Most visitors are well aware of the savage fighting that raged on and around the island during the Battle of Okinawa in 1945. Some tourists pose for photographs next to a monument that marks the spot where Pulitzer Prize-winning U.S. war correspondent Ernie Pyle lost his life on April 18, 1945, while others clamber through the shattered ruins of the island’s former pawn shop. 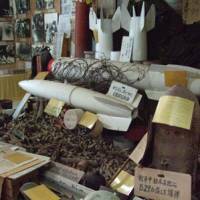 However, judging by the lack of names in the visitor book of the Treasure House of Life museum, very few people know about the second American invasion of Iejima — the one that occurred in 1955. 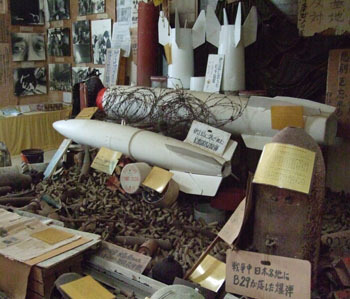 In the barracks-like museum, photographs chronicle the underhanded way in which, 56 years ago, the U.S. military went about transforming the western half of Iejima into an aerial bombing range. With all of Okinawa under U.S. administration, the authorities started by tricking the landowners into signing voluntary evacuation papers, Jahana says. But then, when some families refused to leave, 300 U.S. soldiers with rifles and bulldozers dragged women and children from their beds, tore down their homes and slaughtered their goats. 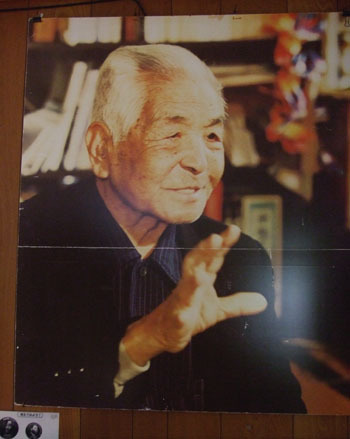 “That’s when Ahagon-sensei decided to act,” says Jahana, pointing to a large poster of a smiling man with a tanned face. 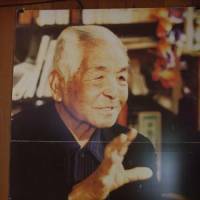 Shoko Ahagon — the father of the Okinawan civil rights movement — was not your average farmer. As a young man, he converted to Christianity and went to Cuba to seek his fortune. Returning to Iejima, he’d embarked upon a temperance campaign. His experiences of talking the island’s hard-drinking menfolk into abandoning their awamori spirits would prepare him well for his bid to persuade the Americans to return their land. Inspired by Gandhi’s principles of passive resistance to British rule in India, Ahagon drew up a list of policies for the farmers in their dealings with the military. These included the need to stay calm and retain faith in the inherent good of individual Americans. 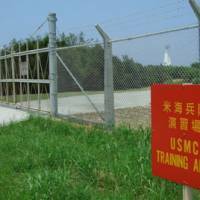 These policies are painted in big letters on the museum’s wall — and they continue to inspire Okinawa-wide struggles against the presence of U.S. bases. Another tactic still influential today is the organization of mass demonstrations. 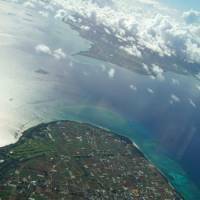 In July 1955, Ahagon led the displaced farmers on a seven-month circuit of the Okinawan mainland in order to inform people of their mistreatment. At a time when the United States kept the Okinawan press strictly censored, this “Beggars’ March” won the farmers much-needed publicity for their plight — yet the U.S. military remained unmoved. Upon their return to Iejima, the farmers were forced to live in tents on the barren land to which they’d been relocated. With their crops gone, they resorted to foraging on the margins of the bombing range for shrapnel to sell for scrap. The museum’s photographs show the tragic consequences of such desperate actions — farmers were shot by American soldiers, maimed by stray bullets or blown limbless as they attempted to defuse unexploded ordnance. Despite these atrocities, Ahagon and the farmers never gave up on their appeals to the conscience of the U.S. military. After leaving the museum, I head to the island’s west coast in order to see for myself the American base. While the military has moved its live ammunition drills elsewhere, it continues to use the installation to practice parachute drops — and barbed-wire fences cordon off a massive expanse of Iejima’s most fertile farming land. Outside the base, in the ashes of a farmer’s bonfire, I spot charred cartridges and the tail fin of a rocket — reminders of the bitter harvest some islanders died collecting. A short walk away stands an A-framed building with freshly painted slogans on its walls. This is the hut from where Ahagon and the farmers used to ensure that the Americans’ exercises did not stray beyond the confines of the base — and it was from here that, in 1966, they staged a successful campaign to prevent the U.S. military from installing nuclear-armed Nike missiles on the island. Recalling the museum’s photographs of this hut packed full with demonstrators, I peer through the building’s windows. Its newly painted exterior proves deceptive — inside, the room is thick with dust and looks abandoned to the spiders. Behind me, an elderly farmer pulls up on his tractor. When he finds out I’ve just come from the museum, he tells me he used to know Ahagon well. “Ahagon-sensei dedicated his whole life to the islanders of Iejima. He was a hero,” he declares. Pointing to the rundown building, I ask the farmer about the current anti-base movement, and he tells me most of the islanders have been bought off by Japanese government land leases and public works. I remember the examples of this policy I’d passed on my way here — Iejima’s village hall is as large as many mainland cities’, and billboards announce the construction of an enormous subterranean dam. When I ask the farmer how he thinks Ahagon would have felt about these projects, he seems uncomfortable. For a moment, his eyes flit over his brand-new tractor, then he guns its engine and tells me there’s a festival that night that would make a much better story than dredging through the island’s unhappy past. I decide to follow the farmer’s advice. Near to where the Americans came ashore in 1955 there now stands Iejima’s only resort complex. The hotel usually organizes tours to renowned offshore diving sites — but tonight it appears that the entire island has gathered for the hotel’s annual festival. 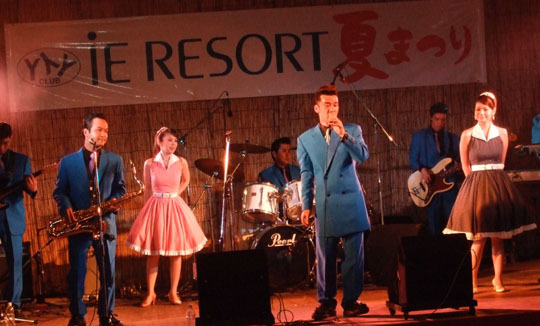 On stage, there’s a rock’n’roll cover band playing so well that for a moment I think they must be miming — until the duck-tailed lead singer improvises a lyric in the Uchinaaguchi language of Okinawa. The crowd goes wild — blending ’50s twists and shouts with Okinawan-style whoops and kachashi hand curls. At the front of the audience, I spot three foreign men. Dressed in civilian shirts and shorts, it’s not their crew cuts that give them away as American servicemen, it’s the way they dance with rolled shoulders, flashing gang signs to each other. The islanders give them a wide berth — everyone, that is, except for a group of Iejima’s children who stand behind the young men, impersonating their macho dance moves. Sensing that something is up, the foreigners turn around. The children freeze and act innocent. As soon as the Americans look away, though, the kids laugh among themselves and resume their crotch-grabbing mimicry. Elsewhere on the island, Ahagon’s legacy might be on the decline, but here — at least for one night — it’s heartening to see that Iejima’s spirit of resistance is alive and well. Getting there: From Naha Airport, Motobu is a 2?-hour drive or bus journey. Ferries leave from there for Iejima four times daily — with an extra departure in the peak summer season. The timetable can be found at www.iejima.org/ieson/index.php?oid=93&dtype=1000&pid=91. Bicycles can be rented from shops near the ferry terminal.